An easy to use lozenger that increases salivary flow in patients suffering from dry mouth conditions. SalivaSure® has no side effect which the systemic drugs of its type have. 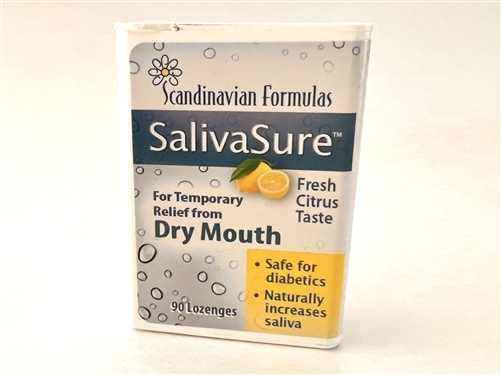 SalivaSure® provides refreshing, instant relief from the discomforts of dryness of the mouth, termed "xerostomia." Dry mouth is usually associated with the under-functioning of the salivary glands. Directions: Allow one tablet to move around and slowly dissolve in mouth. Repeat as necessary. In severe dry mouth cases, one tablet per hour is recommended. 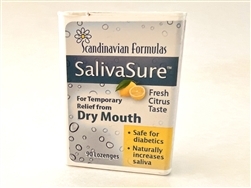 SalivaSure® provides instant relief upon contact.